Brittany misses her sisters—and her magic. After being fired from her job as Interim Fate—which she only had because her dad, Zeus (yeah, the Zeus), tried to get rid of true love—Brittany finds herself living with her mom and stepfather in someplace called Superior, Wisconsin. Oh, and her eight half and step siblings live there, too. Eleven people, one house, and a whole lotta new things to learn about. Things like snow and sunburn and, well, being mortal. But that might prove harder than she thinks. Because Zeus wants his daughters back. Three of them, anyway. 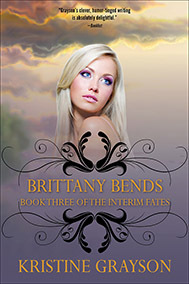 The three former Interim Fates: Tiffany, Crystal, and Brittany. Tiffany and Crystal already made their choices. Now Brittany must decide whether she will fight for what she really wants—if she can even figure that out—or bend to the will of her powerful father and the allure of magic. Grayson’s clever, humor-tinged writing is absolutely delightful.